Lord, may I register to go to Hell instead? This game is a blast, it's fun, plays great and as a bonus, when played on the XBOX 360, it has DOOM, DOOM2 and more. If you enjoyed Doom 3, then you should enjoy this game. Both of the Doom 3 games are all about heaping on the tension; combining a creepy atmosphere with enemies that like to attack out of dark corners or from behind. It's definitely a different feel from FPS like, say, HALO, and maybe it's not for everyone. But I dug it. That being said, I do have some complaints about Resurrection of Evil... first off, the game is substantially shorter then Doom 3-it seems that by the time you get the hang of the new weapons, the game is over. This would be no big deal if you were buying it as an expansion to the PC version, but the X Box item is a game unto itself. And it is actually more expensive then Doom 3! On top of this, the game didn't seem to be as polished as Doom 3: there are problems with sound synchronization, blocky visual artifacts and, on more then a few occasions, the frame rate starts choking. I had none of these problems with the first game. Scary! It starts out fast, and gets you pumped up with fright right away. Plenty of gr-oss stuff to freak you out, MAN! I can't seem to figure out how to hold a weapon and a light at the same time. What the humphrey bogart is that on the end of my finger!?! How is it that a guy can't hold his pistol and his flashlight at the same time? With all the cool tech available to the guy in the game, why can't he equip his shotgun with his flashlight. I was having so much fun until I came upon a dark part in the game that needs extra illumination, but when I found out that I could hold either a light or a weapon and not both, I was dumbstruck. How stupid! Or did I miss something. Am I doing it wrong, or in the story beginning does one of his hands go numb and useless when he touches his flashlight? This is a major flaw! I can't believe the stupidity that went into this minor game detail, that for me, ruined all the realism to the point that I wasn't even scared any more. Cops hold their pistols over their flashlights all the time, why can't marines, damn it!?! 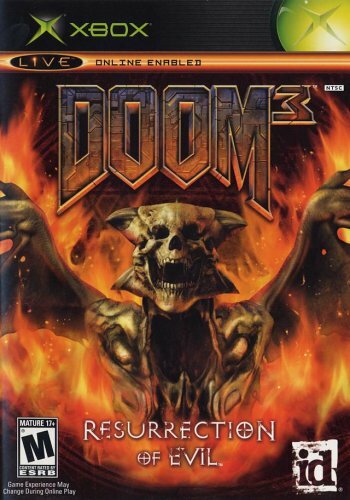 First off i would like to say that in my opinion resurection of evil is not better than the other doom3 but is a great add on to the already perfected doom3. This game doesn't lack much except for the fact that the stages are shorter. This i didnt like, if it was just expanded a couple stages more and made longer this game would be perfect. But i think this game is better weapons wise. You get most of your weapons in the first 3 stages, and not like in the other doom3 were you got a gun per stage. :P otherwise this is an exact replica of the other doom3. Well in this doom3 there are 2 new foes and 2 new weapons to choose from. -well im not sure what the 2 new enemies are called but there called something. -The two new weapons are a gravity gun and sarges double barrel shotgun. (which is my favorite weapon) I also think the shotgun is the most affective throughout the game until you get the rocket launcher and the plasma rifle. But also in this doom 3 you get a pretty cool artafact that gives you skills of destroyed foes. It is like a soul steeler err something. 1. is where you kill a big teleporting beast, this gives you the power to move at tremendious speeds,everything is slow motion except you!! very cool. 2. is were you kill another huge beast that has a diferent power, this gives you the power of berserker. berserker gives you the power to attack 3X as effective when you shoot an enemy, basically 1 hit kill with sarges double barrel. 3. the third boss when defeated gives you invunerability. this allows you to walk on any terain. which is useful in hell and fighting the final boss. ALL THESE SKILL are used at once and you must activate the artifact to do so. You need to steel souls of dead marines and othe people to charge the artifact. Short and sweet,am i talking about the game or my review..?? ?